When Jennifer wrote in her last blog about Caden never getting to take a break from autism, that got me thinking. She’s right, as parents of a child with autism, we have the chance to take a mental (or physical) timeout from the struggles of autism knowing that the other will be there to shoulder the load. Caden doesn’t have that opportunity. As Jenn said, even sleep is a challenge for him. Since Caden was a baby, getting him to sleep and stay asleep has been a nightly battle, and we have brought out every weapon in the arsenal over the years. For the first 6 months or so, we found that the tag-team approach worked the best. One of us would start out holding him in the recliner until inevitably one body part or another would go to sleep, spasm, ache, or otherwise give up, and then reinforcements would have to be called in, and the other one of us would take over. After about 6 months, we had to start the divide and conquer method with getting our kids through the nightly medicines and bedtime rituals, and so it came to be that Jenn would take Ryley and I would take Caden. Many nights, from age 1 to about 3, I would wind up wrapping Caden in a blanket, putting him in the van, and driving him around the country roads for anywhere between 15 minutes and 2.5 hours. He would eventually fall asleep, and I would then have to figure out how to get him out of the van, unbundled, and into his crib without waking him up again. More times than I care to remember, his eyes popped open just as I would close his bedroom door, and the process would start all over again. The last 2 years have had us try various lotions and potions, big boy beds, blankies, lights on, lights out, until we finally settled ourselves on the nightly ritual of Caden and I making a temporary bed of blankets on the family room floor, reading a book, having a night-night snack, watching part of a show on how to build something or other, and then eventually him drifting off to sleep. Sometimes that process takes 15 minutes, sometimes two hours, but it works for us and it is our routine now. And it’s at this point in the evening that I start to wonder, does he get to be “just” a boy now? Does sleep, that thing that we have struggled to get him to and keep him in for 5 years now, loosen any of the hold that autism has on his mental and physical being? I know, know, of course he always has autism, but is it wrong to hope that for those couple of hours that he is deeply asleep that autism gives him a break? Is it wrong to hope that when he dreams, he gets the chance to just be a kid? Before I get up from the family room floor every night after I am sure he is sound asleep, I lean over (carefully so not to crush Elf who is always sleeping next to him), kiss him on the forehead, and say “I love you.” That kiss is my wish, my hope, that he is with his friends laughing and playing and running, and that he doesn’t have a care in the world. Imagine spending your entire life at a carnival that just happens to be located in the middle of Chuck E Cheese. I kind of think that’s what life is like for Caden with autism and sensory processing disorder—sounds are louder, lights are brighter, smells are stronger, and life frequently spins out of control. There’s a lot of discussion about the stress associated with having a child on the spectrum. In fact one recent study found stress levels akin to those of soldiers. You won’t hear me disagree with any of this but I think it is easy in all of this mess to forget that no matter how much stress we feel, the stress that the individual with autism is facing is unimaginable. Yes my life is stressful. I work full time at a job that is highly competitive. I have two special needs kids, a service dog who needs constant training, 2 other dogs (who don’t have the slightest word what trained even means), and a parcel of cats. Oh and don’t forget the ant farm. But I have an ability that Caden doesn’t—I can hit the stop button. I can walk out of the room and let my husband or daughter deal with a melt down, I can call a friend and rant for a while, or I can write a blog that lets me express my feelings. Caden never gets a break from autism or sensory processing disorder; even sleep is challenging for him. Limited communication and understanding of complex emotions mean that he doesn’t even have true freedom of speech—he can’t explain how he’s feeling or what’s bothering him most days. When we are lucky we can read the signs but who knows how many things we guess correctly. For this reason and many more we are now focusing much of our attention on Caden being able to express at least basic feeling words –we’ll continue to worry about articulation and vocabulary but honestly more than anything we need to give him freedom of expression. If he had this vocabulary and ability I have a feeling Caden would have a lot to share about his last few days. I think he would probably tell us that while his mommy desperately hoped Saturday's infusion would go smoothly, the IV start was worse than any of us imagined. Not even valium helped the process that eventually involved Caden being wrapped in a blanket and held down by 5 people before the nursing supervisor could get the needle in. After that though, he was a rock star and never bothered the IV or fussed over any of the vital checks or oral meds. I think Caden would probably share that having Elf start Kindergarten full time without one of us on Monday was like his best friend finally getting to go to school with him. And he would have to mention that Elf has handled everything like the absolutely amazing super dog that he is (and that his mommy will be devoting an entire blog with pictures to the Kindergarten process and how to handle it). And I'm pretty sure he would share that his first ever swim class was a lot of fun even if he did alternate between the phrases "I'm doing it" and "I'm scared." More than anything else, I'm SURE that he would want to point out that this is no ordinary tale but instead is a tale of a boy and his dog (or should that be a dog and his boy)! 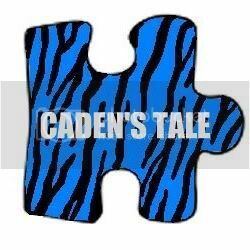 Caden was diagnosed on Tuesday with an immune deficiency similar to the one that his sister has. This diagnosis isn’t a surprise; it comes after years of blood testing, specialty appointments and infections that weren’t typical in terms of type or frequency. In many ways the diagnosis is simply a label that allows us to move forward with treatment for a condition we have been trying to deal with for years now. Although there are a number of different types of immune deficiencies most are characterized by a suppressed immune system that renders an individual unable to fight illness. As one would imagine, with the immune system being contained primarily in the bloodstream, any and all areas of the body are vulnerable to infections that are often difficult to treat. Additionally vaccines are often ineffective because without a properly functioning immune system the body is unable to remember (i.e. produce titers) the diseases that it is exposed to. Complications are the norm as are co-existing conditions; although there are treatments to date no cure exists. I can’t speak for everyone with an immune deficiency any more than I can for everyone with autism but based on Ryley’s experiences I think I can fairly safely state that immune deficiencies stink. She has been in the hospital more times than I can count, has had 13 surgeries with another one scheduled tentatively for June, has spent a great deal of her life in isolation, has had to complete school 2 years virtually due to illness, and has been disappointed by missed birthday parties, end-of-year celebrations, and just plain life fun more than I want to relive at the moment. She has had tests and procedures most adults will never hear of, let alone experience but through it all she has been a rock star. Ryley has always been mature when it comes to the medical arena. She has not always liked what she has had to endure but with discussion and appropriate bribery she has been able to tolerate almost everything the medical community has put her through. Not going to lie here---between the ages of 1 and 3 I think we personally kept the Nationwide Children’s Hospital giftshop balloon department in business BUT she could focus on the prize and get through the procedures. Autism is throwing wrenches in this diagnosis in ways that I could have never imagined. Caden will start his first immunoglobulin (human plasma) replacement infusion tomorrow alongside his sister. He has been awake since 3am worried, anxious, and scared over the needles that tomorrow will bring. No amount of discussion, redirection, or offer of bribery has swayed him. I have spent hours today trying to explain why he has to have “the needle” as well as rocking him while he has had unlimited access to blankie and pacifier---this is traumatizing stuff, the chewy is okay but we needed the big guns today. He has cried and begged and cried some more and I can honestly say my heart is totally broken. Other autism and sensory processing disorder challenges will include keeping an IV in for 6-8 hours, vitals being checked every 15 minutes the first hour and then hourly after that which means being touched a lot, hospital noises, changes in routine, hospital food and maybe most worrisome the inability to articulate side effects or complications as they arise (something I’ve been immensely grateful that Ryley has always been able to do). But getting through this is going to stink. I can only hope Caden’s fears don’t cause anxiety for Ryley and that the nurses don’t transfer Ryley’s acceptance and understanding to Caden. I can only hope that these infusion experiences don’t create another reason for Caden not to be able to sleep or another medical fear that he has to live with. Research has indicated that immunoglobulin infusions can have a positive impact on autism so that’s something that I will be hoping for as well improved health. I think though for now what I will be most hoping for is that somehow Caden can know in his heart that my heart is breaking with and for him and that more than anything I love him and wish I could take this pain and fear away from him.